3DElite has a Delphi XE5 Firemonkey component for reading and writing ID3v2 and ID3v1 tags in audio files. The ID3v1, Lyrics3v2, and ID3v2 tags are the meta data where the song title, artist, album, year, genre, lyrics, and more are stored. This component is free in free software otherwise for commercial software it requires a license. That also means you can just download it and try it out for free. 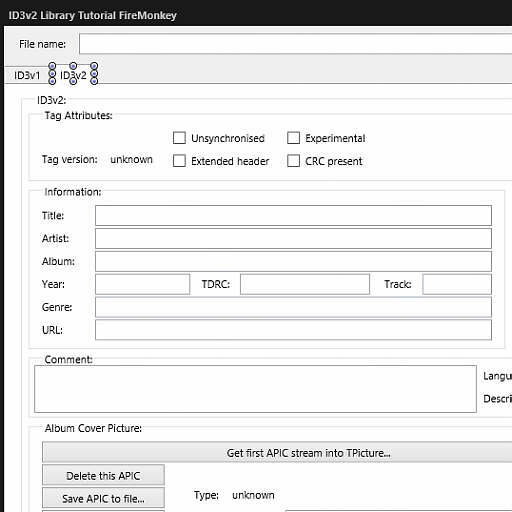 It includes support for WAV and AIFF file formats (and possibly MP3 but it does not mention it). It doesn’t require any external libraries and it runs on all Firemonkey platforms include Android, IOS, OSX, and Windows. It fully supports Unicode and you have direct access to all frames using a TMemoryStream. If you’re looking to build any kind of audio player for mobile devices this might be a must have component to access all of the meta data on the files your player is able to play. Head over and download the full component for accessing ID3v2 meta data.